The answer might seem glaringly obvious. Nothing, because you’re going to do your makeup yourself. If you’re comfortable with doing your makeup and feel confident enough to have a go yourself, then don’t let anyone tell you otherwise. Don’t forget though, you might need to invest in a few products that’ll last the day. And that alone will make a good old dent in the budget. That’s not forgetting the time you’ll spend reading blogs and watching product reviews to figure out which products will make the cut. But that aside, there are so many other factors involved on the day that you might not have thought about. The biggest being time, stress and distractions. 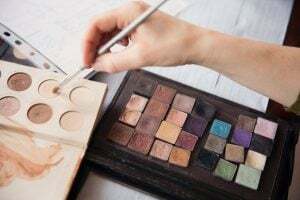 Your wedding makeup will take you longer than usual. You’ll more than likely be in a room with your bride tribe, mother and flowergirls. And as much as you love them and want them to share the morning with you, to put it bluntly, there’s a reason you don’t live with them and get ready with them everyday! Let’s face it, that bridal suite might be feeling a little small even with its two bathrooms and four mirrors. There’ll be jokes, laughter, doors knocking, doors slamming, deliveries, spillages, interruptions, venue checking, panicking, shouting, maybe a few sentimental tears, phone calls and that’s all before you discover you have 100+ unanswered congratulatory Facebook, Instagram and Whatsapp notifications to plough through. Not your everyday prep audience, eh? That Makeup Artist and Hair Stylist quote maybe doesn’t sound as pricey anymore, right? And that’s probably because we are so often worth our weight in gold (even if I do say so myself). Patient and calm are often what the reviews say. Fitted in like one of the girls. A good listener. And that’s because we’ve seen a fair few prep mornings in our time, in lots of locations, and always with different party dynamics. Realise you can’t actually buckle your shoes in that dress? We do it. Can’t remember how to lace your dress? We can. Don’t know what side your buttonholes go? We know. Not sure when you have to talk to the registrar? We do. We’ll do way more than what you hired us for, because we love what we do. So how can you get the right team and save time and money in the process? Clarity on the look you’re after is crucial if you’re going to save yourself money and time. Use Pinterest, start a scrapbook, screenshot images. The more you pin, the more likely you are to find the look that you really want. You’ll begin to see trends across your collections and when it comes to researching your Artist and Stylist you’ll be able to check their work against your boards and decide whether they’re a good fit for the style you’re after. It’ll save you money in the long run on failed trials. Afterall, if it’s a natural look you’re after and the Artists signature look is glam; naturally they might not be your first choice. 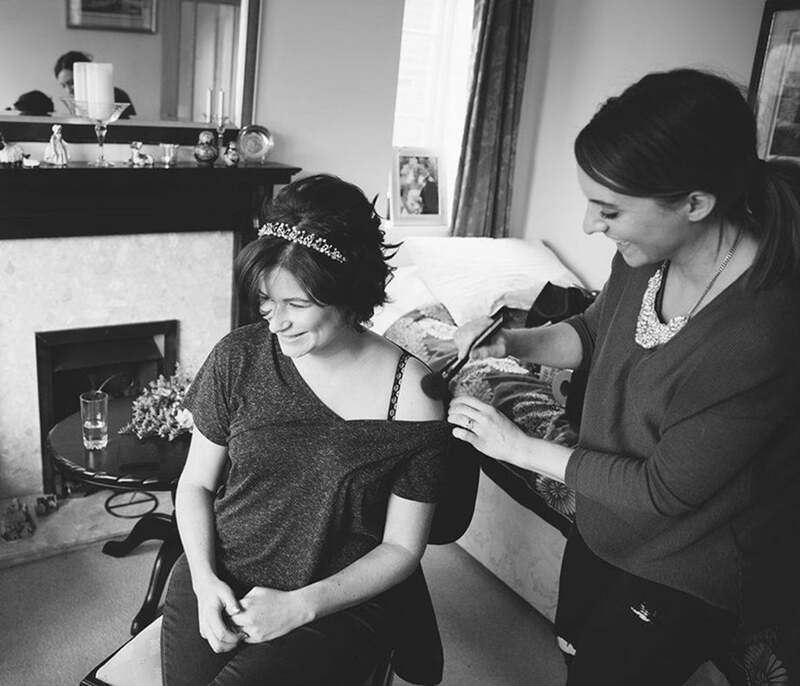 So you’ve found your bridal style and you’re ready to look for a professional? Firstly, listen to your friends experiences. Word of mouth is the best testimonial. Or there are places you can find reviews. Lots of us have Facebook reviews that are public, which you can read. I even have a few in an Instagram Highlight too. Otherwise we all have testimonial sections on our websites where you can read through the experiences of our other brides. Maybe even get down to the wedding fair they’re at and meet them? Again, you can save time and money if you know what you’re after in your Artist and Stylist as people. Contact those that tick your boxes with their reviews and in person first. Every wedding has a budget. I’m married too and it is a factor. But don’t pick your professionals based solely on price. Asking only for a quote doesn’t allow suppliers to explain their value to you. So essentially you might miss out on an absolute gem by asking only for their price. Chat with us. We like that! We love to hear how every wedding is different, we love to know what your anxieties are so we can explain how we can help you and solve your problems. That’s why we’re in this business. We love what we do! For example, based solely on price you might have just overlooked an artist who is awesome at covering acne, because they’ve had it too. And acne was one of your main concerns. I’ve been that bride. And when it came to it, flawless skin was priceless to me, even though I had a budget too. Your hair and makeup are really the icing on the cake! Alongside the dress, they’re what people are going to be looking at when they speak to you. As the bride, you are the focal point of the day. Your wedding day should be the happiest day of your life, not the most stressful. So while budget is a factor in every wedding, wedding suppliers are here to make your day run perfectly. To save time and money the biggest thing you can do is your homework. Get to know your suppliers… chat with them to find your perfect fit so you can enjoy the mayhem and chaos of your prep. It’s meant to be fun. While you’re in hands you know you can trust, you can focus on creating some lasting memories with your nearest and dearest. And isn’t that the whole point? You are a diamond Helena! This is great perspective. Very real and very true.